If your big kid has outgrown the gentle curves of the Tomorrowland Speedway and has begun to bypass Dumbo in favor of Pirates of the Caribbean, it is time to experience some of Disney's more grown-up attractions. Disney offers plenty of rides that pack big thrills, but don't try to make the switch from "it's a small world" to Expedition Everest in one day. Most big kids are ready for more speed, more chills, and a few frights, but doing too much too fast can backfire, and make your big kid afraid to try anything new. The rides on this list will appeal to a big kid's sense of fun and adventure without being overly scary. Once your older child has mastered these attractions, head for Disney World's most thrilling rides without worry. Splash Mountain makes an excellent transitional ride for older kids. This watery adventure ride features all the whimsical fun of a Fantasyland attraction, but with a stunning drop and a few dark scenes. Tip: Traveling with kids of different ages? The little ones can play in the Splash Mountain playground while big kids ride; just use the rider switch option to split your party. While Toy Story Mania is suitable for the whole family, big kids will likely have the video gaming skills necessary to score high on this attraction. Toy Story Mania is a video game/ride hybrid located in Disney's Hollywood Studios; and, as of 2011, it was the hottest ride in the park. Be prepared to sprint for this one when the park opens, or snag Fastpasses for later; you'll need them. Love Toy Story Mania? 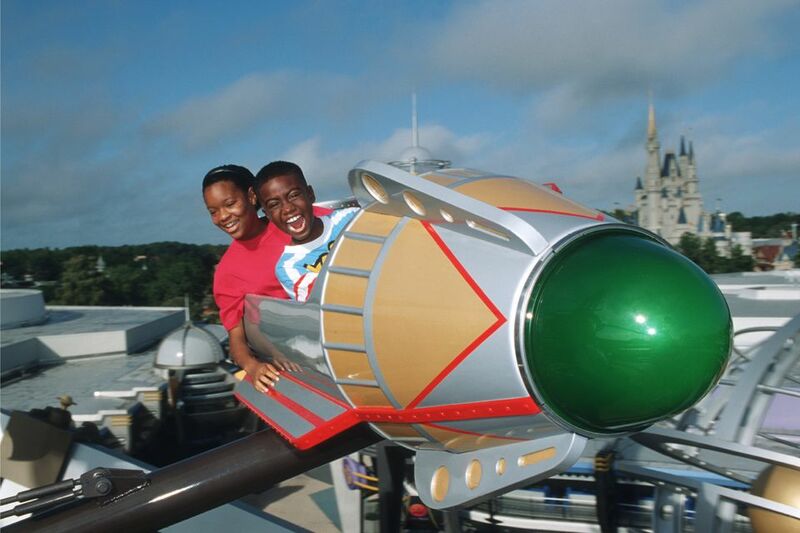 Don't miss Buzz Lightyear's Space Ranger Spin, another video game/ride hybrid located in the Magic Kingdom. Big kids will love the twists and turns in store at Test Track in Epcot. Disney World's longest and fastest ride is surprisingly educational as well; the early part of the attraction simulates the tests real vehicles go through before they are sold to consumers. If the line for Test Track is too long, pick up a FastPass+ and enjoy later in the day without waiting. Star Tours is based on the wildly popular Star Wars series of movies. Located in Disney's Hollywood Studios, this ride reopens in May 2011 and is sure to please the big kids in your travel party. Traveling with Star Wars fans? Don't miss our list of the best Star Wars based rides and attractions at Disney World! Head to Disney's Animal Kingdom for an up close look at some of the world's most fascinating wildlife. Older kids will enjoy spotting the different types of animals as they freely roam the 100 acre savanna; and, most kids will appreciate the adventure aspect of this attraction as well. This attraction is suitable for animal lovers of all ages, so the entire family can enjoy it together, but it is a bumpy ride.